Hey, so yea as I said in another post for a college project over the next 11 weeks I will be modding / building an xbox case and hopefully have a working xbox inside it…lol. However, when I powered up the xbox I found it was already modded and it booted to the Evox dashboard. Wehey! Less work for me. So far I have opened it up, put in a 20GB HHD and installed Slayers Evox Auto installer V2.6. The XBOX works perfectly, I tried booting the xbox without the DVD drive installed and it gave me Error 12, Im assuming this is because the BIOS installed does not allow this? 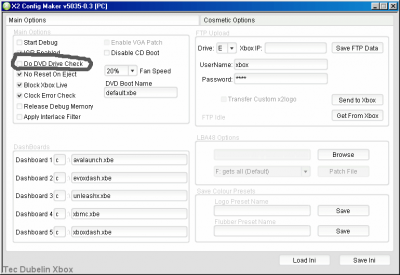 I know Xecuter2 4981 allows no DVD drive so how can I install this BIOS onto my xbox? or in not so many word how do i install a new BIOS to the mod-chip in my xbox? Any help / pointing me towards a how-to tutorial would be greatly appreciated thanks! P.S sorry this post is quite long lol. That chip will accept any 256kb Bios, Id use the Evo M8 137 or xecuter x2 5035 bios. 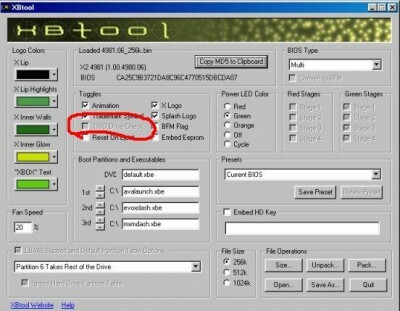 You can flash the bios through the AID disc or through the evox dashboard, or download the `Eurasia pro generic flash disc` to do the flashing. Cheers for the advice user1, it worked great! I downloaded the evox.m8plus.fc.137 BIOS, edited it in EVTOOL and flashed it to the XBOX through the EVOX dashboard. One small thing though, The XBOX works and functions just as it should which is excellent, but the Flubber animation at the start-up jumps and the sound gets cut short, also the Evox dash says the DVD drive is init and the eject / power light constantly flashes. When I plug the DVD drive back in all these symptoms go away. Any idea what’s causing this? Is it a HDD problem? Is something still looking for the DVD drive? But still thanks again user1. The stuttering at start up is due to using xbtool, you could try reflashing with a 256kb xecuter bios (x2 4981) and use the relevant config maker and see if that fixes it. or you could use xbtool to totally do away with the flubber animation altogether. The unleashx dashboard has an option to set the colour of the power/eject LED, you could maybe install unleashx as an application and use it to change it to constant Green or Red. (you might have that option in Evolutionx dashboard, i dont know). Keep tinkering, you`ll get there in the end. I played around with it abit but no luck so I have decided to leave it. Since it effects the xbox hardly at all im not too worried. Now a different question I want my xbox to light up! I have these small ambient lighting things at my disposal that I would really like to use. They are ball shaped things which glow different colours, they fade from red to yellow to blue etc.. The light is powered by three 1.5v micro cell batteries, aka 4.5v. I know there is a 5v wire going to the xbox HDD which I have used in other xbox mods to power leds, so im wondering could I power it from here? I know it is 0.5v too much so would that do damage to the xbox / blow up the LED’s? If so what resistor would I need? I don't know anything about your electrical problem but you need to hit the inside of that box with some compressed air! Dusty as hell in there! also i have now solved the lighting question i had.